I Believe in Angels #5, 23 x 21 inches, by O.V. Brantley, 2009. Yesterday was the last day of the 2011 Atlanta Quilt Festival. The festival is c0-sponsored by Hammonds House Museum and the Clara Ford Foundation which I created to honor my grandmother and to celebrate African-American quilting. The two-week long event had been a smashing success with large crowds and joyous creativity. On the last day, however, we had scheduled a day of quilt appraising by Holly Anderson and a beginning quilting class taught by Nina Moore. The beginning quilting class was overbooked, and that was a good thing. The day of appraising was underbooked, and that was a bad thing. In fact, the day before the event, I had considered canceling it because only one person had signed up. When I discussed possible cancellation of the event with my partners at Hammonds House Museum, they told me they had received a call that day from a quilt owner who was very anxious to come in for a quilt appraisal because they had a very special quilt. They wanted the first appointment of the day. Even though that meant we only had two bookings for the day, we decided to go forward. When the special quilt arrived, we were all blown away. The quilt was a documentary of the National Black Theatre Festival created by renowned quilter Joan Gaither! Herman Jones, Director of Theatre South Atlanta was the bearer of the quilt. It was too big for the small room where we had planned to have appraisals, so we spreaded it out on the floor in the gallery of the museum. This happened to be right next to the beginning quilting class. We were so excited about the quilt, we started calling and texting people to come see. Matt Arnett, whose father made the Gees Bend quilters famous, came. He brought Lonnie Holley, a well-known folk artist, with him. Holly Anderson, the quilt appraiser, was so happy to get to appraise such a special quilt that she did not care that she did not have a full day of appraisals booked. But wait, the angels were not finished. Because we oohed and ahhed over the quilt so long, before we knew it, it was lunch time and we were ready to call it a day. But in walked a person with no appointment with 10 quilts she wanted appraised! Because of time constraints, she ended up getting four of them appraised — a perfect ending to a perfect day. Yesterday was a very special day for me, but I know the members of the 2011 Beginning Quilting Class will never ever forget their first day of quilting. There is no way I could have ever planned to have beginning quilters set up their machines right next to what is sure to become one of the important quilts of this century. I could not have planned it, but my angels could. P.S. You can see all of the angels in my I Believe in Angels series on YouTube. 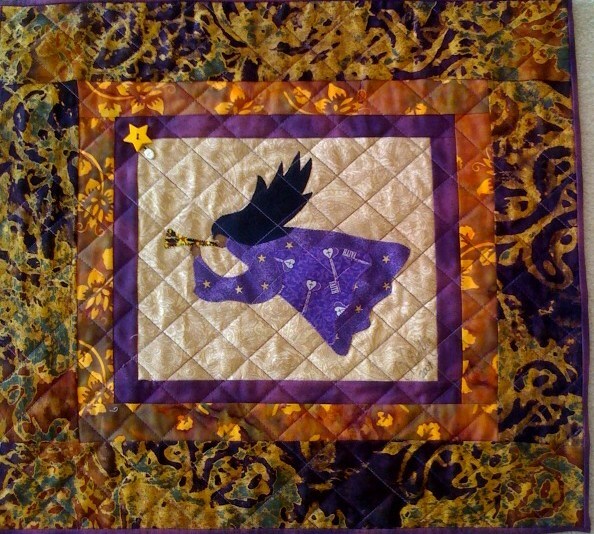 This entry was posted in A Quilter's Life and tagged 2011 Atlanta Quilt Festival, African American quilter, documentary quilt, ethnic, fabric art, Hammonds House Museum, Herman Jones, holly anderson, Joan Gaither, Lonnie Holley, Matt Arnett, National Black Theatre Festival, O.V. Brantley. Bookmark the permalink.